Whether you've been caught out on the trail at night or you're cruising home from an evening out, the Exposure Lights Joystick Mk12 Headlight lights will light your way. 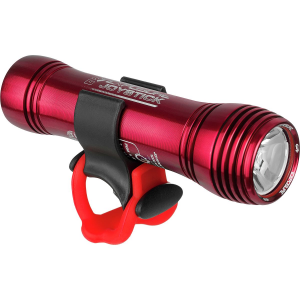 This powerful little guy emits 1000 lumens of electromagnetic radiation (in the visible spectrum, of course) at its highest setting, ensuring that the fallen log in your path is visible, or the motorist who forgot to switch on their headlights. Included mounts let you choose whether to attach this high beam to you helmet or your handlebars, and it's so lightweight you'll barely notice its there. If your nighttime travel is due to a cross-country cycling adventure, the included USB charging cord makes this a cinch to charge at the hostel each night, and it does so in only four hours.